Well, it's always been one of those things I've wanted to do - to start with your most local side and see where the draw and the journey takes each winner of each tie into the next round. 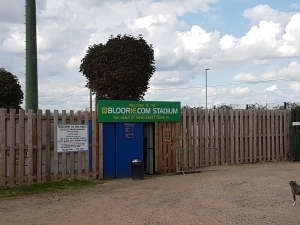 Nathan Scarborough struck deep into stoppage time to hand Hullbridge Sports a dramatic win over Gorleston and send them through to the next round of the Emirates FA Cup. The hosts had come into this one off the back of a decent 2-0 win at local rivals Southend Manor but they were up against very strong opposition in the shape of Thurlow Nunn Gorleston who had seen off Norwich United 4-2 in midweek, so they were also coming into this one in good form and as favourites for this tie. 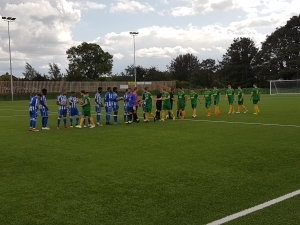 And it was the visitors who created the first opening in the eighth minute when a Hullbridge slip allowed the visitors a sight of goal but the effort was dragged across goal and wide, before the hosts responded three minutes later as an Aundre Spencer cross just eluded Luke Hornsley. The hosts then saw a long range effort deflected wide before they fell behind in the 17th minute when Joel Watts got in down the left and struck a lovely looping effort beyond George Marsh and into the far corner of the net. The visitors looked to be in again two minutes later but a great defensive block denied them, and just before the half hour mark Watts sent an effort inches wide of the hosts goal as they looked to try and double their lead in this tie. Just past the hour mark Ross Gilfedder found himself bearing down on the hosts goal, but saw Marsh save, before the visitors got in down the left moments later, only to see the cross cleared. And then a chance for the hosts came along but sadly for them Adebayo Sotoyinbo could only blast his effort over the bar. The hosts did end the half well and three minutes before the break saw Hornsley ghost past a couple of defenders before his effort at goal was saved by George Parkin, and it meant the visitors held a slender lead at the break. The visitors started the second half the better and almost doubled their lead five minutes into it when Watts saw his point blank effort saved by Marsh, and then five minutes later the hosts defence had to block another effort at goal and you felt the hosts had to step it up once again if they were to remain in this tie. And in the 58th minute they nearly found a leveller when a cross to the near post hit Emmanuel Okunja and trickled just wide of the post, but just past the hour mark Gorleston went close as after Gilfedder rolled his marker, his effort was again saved by Marsh in the hosts goal. The hosts though began to find some momentum again as the game entered it’s final twenty and Hornsley broke down the right but saw his cross put well over the bar by Spencer, but with seven minutes remaining the tie took a massive twist in the home sides favour when a strike at goal was blocked on the line by Jack Tipple. After consulting his linesman, the referee pointed to the spot and sent off Tipple for handball on the line, which he obviously did not agree with, and the hosts had a massive chance to level the tie and then have a man advantage for the final part of the contest. Sotoyinbo duly stepped up to convert and it was all square. Gorleston tried to counter this by charging up the other end and seeing Watts fire an effort straight at Marsh, but the hosts were the ones looking for the winner now and substitute Scarborough somehow headed wide from point blank range, before he missed from close range again moments later. And when the hosts thumped a powerful effort against the underside of the bar you felt they were not going to find that winner, that was until two minutes into stoppage time when Sotoyinbo crossed to the near post for Scarborough to convert into the corner of the net and send the hosts wild with delight as they dramatically took their place in the Preliminary Round and an away trip to Newmarket Town. I was able to attend this game whilst my wife and daugher had a great afternoon at the horse racing down the road! A theme which was starting to become apparent was late goals being scored! 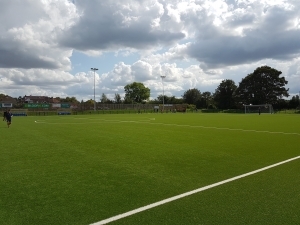 Shaun Avis netted a stoppage time winner as Newmarket Town came from behind to defeat Hullbridge Sports at Cricket Field Road to progress in their Emirates FA Cup Preliminary Round tie. 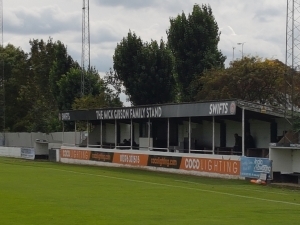 The host had knocked out Cockfosters in North London in the previous round whilst Hullbridge had netted a late win against Gorleston at Lower Road to reach this stage, so both would have been confident of victory. 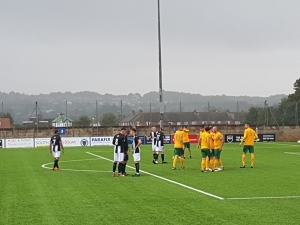 Newmarket had the first effort on target when swinging in a free-kick from the right, but Bridge keeper George Marsh managed to palm away the effort, whilst the visitors first effort saw Nathan Scarborough strike an effort well wide of the Newmarket post ten minutes later. Shaun Avis then saw an effort well blocked down the other end, before two minutes later Adebayo Sotoyinbo struck a fierce long-range effort wide of the hosts goal as the opening quarter of the game remained in the balance. Hullbridge then began to enjoy some good possession and as the half wore on looked the likelier to find any opening that might have been forthcoming, and five minutes before the break found that breakthrough when centre half Daniel Okah found himself in on goal, and despite his initial effort being saved by Alex Archer, the visiting defender managed to slot home the rebound and put his side ahead. 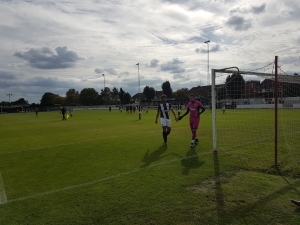 The hosts tried to respond late on in the half and saw a cross thump into the side stanchion before the next attack saw Avis send a looping header wide of the far post, but they could not find that quick leveller meaning the visiting side from Essex held the slender lead at the break. The hosts started the second period a lot more positively and saw Avis strike an effort straight at Marsh after ten minutes of the half, and then moments after full back Jack Whiting hit a terrific effort towards the top corner of the visitor’s goal but keeper Marsh plucked the effort out of the air brilliantly. 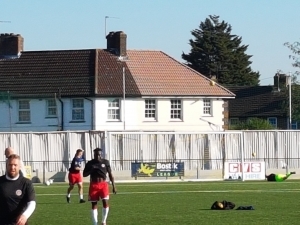 The visitors mounted an attack of their own on the hour mark but it ended with Sotoyinbo blasting an effort way over the bar from a decent position, before the hosts then drilled an effort across goal as they continued to try and find a leveller in this tie. Hullbridge themselves were trying to double their lead and potentially see themselves put one foot into the next round and they mounted another attack through Scarborough, and he laid the ball off to Aundre Spencer but the attacker could only slice wide of the near post. But in the 68th minute Newmarket should have been level as Avis somehow headed against the post from point blank range, and then three minutes later Marsh had to produce another brilliant save to deny Newmarket’s Rhys Thorpe. With twelve minutes remaining Hullbridge broke and that ended with Joe Patison side footing an effort wide of the far post, and then moments later they really should of doubled their lead when a cut back found Sotoyinbo inside the box, but his effort was well saved by Archer, and the visitors would rue this moments later. This was because with nine minutes remaining Newmarket did find an equaliser when a ball into the area saw Avis totally unmarked and he prodded home from close range and it set up a rather interesting last few minutes. 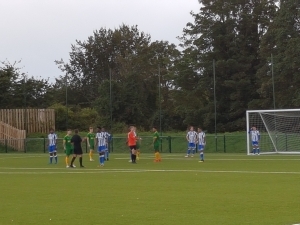 Hullbridge caused some alarm inside the hosts box with three minutes remaining but saw an effort blocked before they managed to clear their lines, and the match entered its final phase all square with everyone wondering if there was going to be a late winner. Well, with three minutes of stoppage time played, the hosts won a free-kick in a dangerous position, and Michael Shinn curled a free-kick against the post and then saw Avis react the quickest to side foot home the rebound into the net and send the hosts wild with delight. 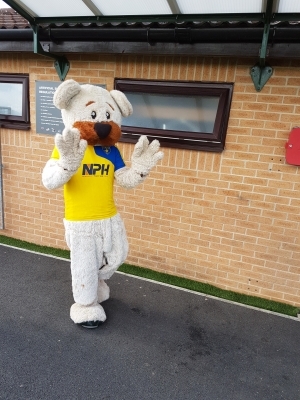 Heartbreak for the visiting ESL Premier side but it meant the Thurlow Nunn Premier hosts went through to Monday’s First Qualifying Round draw. 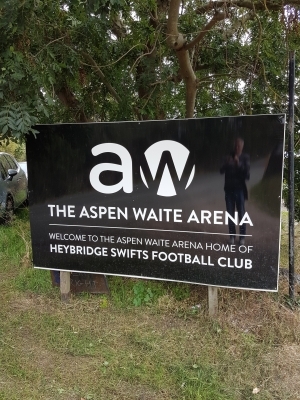 IN A NUTSHELL: Swifts returned to winning ways with a comfortable victory against their Thurlow Nunn Eastern Counties visitors after a tight first half. 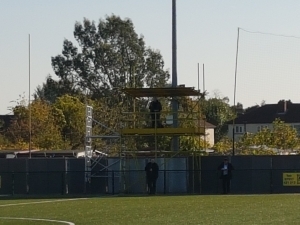 The home fans sportingly clapped off Town manager Michael Shinn, a former Heybridge player. Swifts now look forward to the draw for the next round on Monday. KEY ACTION: Swifts midfielder Harrison Chatting saw his early curling strike come back off the bar and the rebound was headed in by Matt Price, only to see it given offside. Rhys Thorpe went close for the visitors. 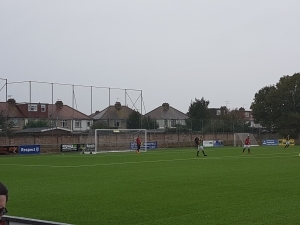 The second half was more one sided affair as Swifts created a number of chances, only to be denied repeatedly by keeper Alex Archer. The deadlock was broken on 63 minutes when Chatting fed Luke Callander and his cross was slotted in by Sam Bantick. Nick Brown capped a fine performance on 83 minutes when he slotted home past Archer when put free on the right. This was a game that had everything, with drama and a script that might well have been written and directed by Steven Spielberg – it was that good. 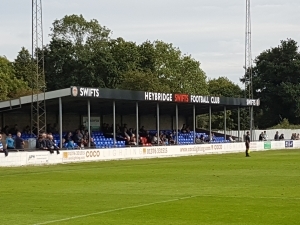 Despite Heybridge Swifts racing into a 0-2 lead, The Hornets pegged them back to level the scores 2-2 at half time, and when Swifts retook the lead during the second half, goals from Rob O’Toole and Chris Smith completed a superb comeback in the final fifteen minutes as Hornets fans saluted their team off at the final whistle while Swifts finished the game with ten men. 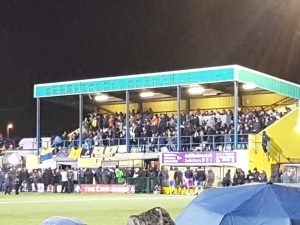 While Horsham fans will more than likely be more interested in the fact their team won, spare a thought for Swifts fans who made the long journey down. This was the second game in a row in which their team had surrendered a 2-0 lead despite Horsham conceding two of the softest goals likely to be seen this season as it appeared Horsham might be in for tough afternoon, thus credit however must still go to Dom Di Paola’s side, who refused to give up and continued to battle to ensure they go into the draw on Monday. 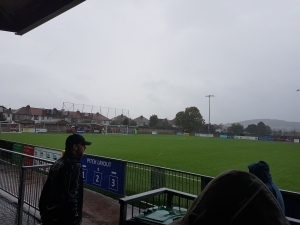 With conditions appalling, the visitors appeared to be quick to adjust to the slipperiness of the ball and pitch as the rain lashed down, and it took them just six minutes to open the scoring as Horsham struggled to deal with the pace and tenacity of Swifts’ movement as a low centre found George Craddock in plenty of space, and his goalbound shot took a deflection to nestle past Josh Pelling to give Swifts the lead early on. With Horsham struggling to get going, The Hornets found themselves with a mountain to climb on fourteen minutes, when they conceded an embarrassingly soft goal from a set piece. With the corner sent over towards the near post, the failure of anyone in a yellow shirt to deal with the danger meant that the ball bounced off Alejandro Seoane-Barber who barely needed to do anything as it tricked into the net. The Lardy Boys began to fear the worst, yet found a route back into the contest five minutes later when Rob O’Toole’s header back across into the box was picked up upon by Steve Metcalf who directed his looped header upwards, and over visiting goalkeeper Danny Sambridge. A fierce strike from full-back Joey Taylor was struck cleanly from outside the areas, but he failed to keep it down as the ball lifted upwards and over the bar. 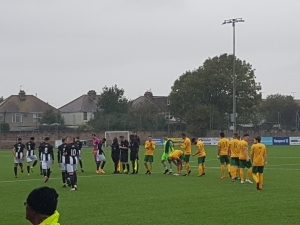 Having conceded from a corner, Horsham then scored from one themselves when Joe Shelley climbed up to beat Alie Njie as he forced home to bring the scores level. 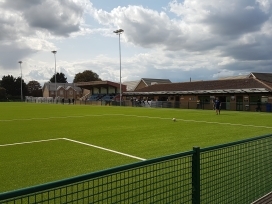 Charlie Harris’ freekick from just outside the area was hit towards the top right corner, but was saved brilliantly by Sambridge, while another Shelley header – again from a corner – was clawed away by the visiting shot-stopper as Horsham began to ask questions of the Heybridge defence. 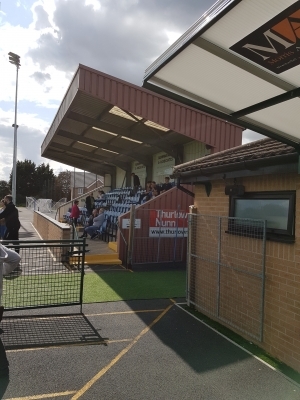 With the game anybody’s to win, Horsham began the second period looking to get the next goal to put them in front for the first time as they pressed and won another corner. The dangerous ball being drifted over for Lewis Hyde to meet, however despite space available, he failed to direct goalwards, instead sending the ball across the face of goal as the move broke down. 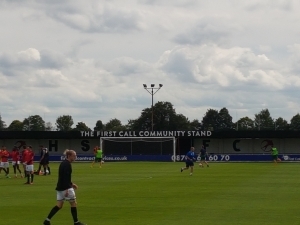 Will Hoare’s freekick pumped into the box then flew beyond everyone inside the box as Shelley missed with the header, while Lee Harding tried to apply the finish at the back post, yet Swifts managed to turn the danger away. A moment of controversy then arrived when Harding burst into the box and found himself shoulder charged off the ball by Seoane-Barber who made no attempt to play the ball, yet despite the linesman flagging, referee Mr. Ryan Head remained unmoved as waved for play to continue to the fury of the Horsham supporters who felt the Hornets forward had been unfairly challenged. A minute later, Horsham found themselves behind again having barely digested the referee’s decision. A marauding run by Nicolas Brown culminated in a speculative effort from twenty five yards taking a deflection off Daryl Coleman and creeping in beyond Pelling who couldn’t reach his far post in time. Di Paola’s response was to throw on former Bognor Regis Town midfielder Harvey Sparks in exchange for Will Hoare, as Horsham added more firepower and went for a more attacking formation, and the move paid dividends six minutes later when he chased a threaded ball to send in a superbly whipped low ball for Rob O’Toole to poach as he slid in from close range to make it 3-3. Galvanised, The Hornets found the bit between their teeth as they decided to make the visitors pay, and they should have gone in front minutes afterwards. Tyrell Richardson-Brown’s lovely dinked ball to Chris Smith appeared destined for him to net, but despite being in a super position to put The Hornets in front, he failed to find his composure and blasted woefully over the bar. Horsham began to tighten their grip, with Richardson-Brown cushioning the ball down nicely for Smith who took a touch and stroked just wide but the pressure told six minutes from time as Smith bundled in from eight yards out, forcing in the rebound after Sambridge had parried Sparks’ initial effort. 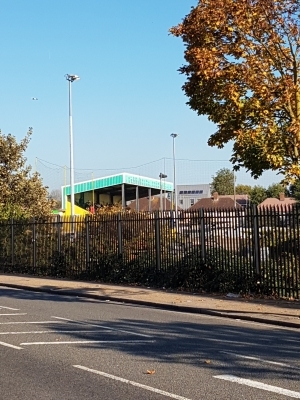 With the goal sparking scenes off and on the pitch as Horsham fans went wild, Swifts striker Luke Callender’s loss of temper resulted in his sending off off three minutes later when he talked his way into the referee’s book for an early shower, as Horsham looked to kill the game off against ten men. With the game heading into injury time, Richardson-Brown skipped past Njie easily to find himself behind the defence, but despite being urged to finish the move himself, his pass across the face of goal failed to find anyone when it would have proved better to have been more selfish. A nail-biting finish with twenty seconds remaining saw Swifts win a corner in which everyone including Sambridge was sent up into the box for, but the roar of delight as Horsham cleared their lines, followed by the whistle summed up a wonderful afternoon as Hornets fans dare to dream of another famous FA Cup run. Goalmouth action might have been in short supply, certainly compared with a fortnight ago, but this match had spectators gripped from the moment Richard Gillespie gave the visitors the lead after little more than ninety seconds and reached a crescendo just before half-time when Joe Shelley headed in Horsham’s equaliser. 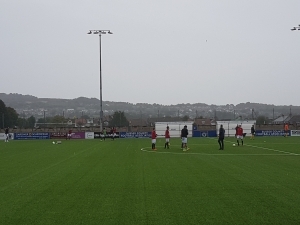 Both sides had the opportunity to win it after the break, most notably late substitute Harvey Sparks, but neither goal could be breached again so it’s off to The Black Gold Stadium on Tuesday night to decide who goes through to the final qualifying round. 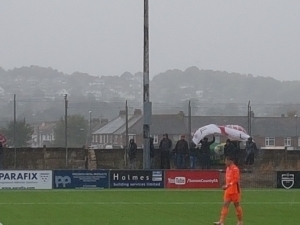 The dreadful conditions kept the crowd down to a more modest attendance than had been hoped but there was no shortage in cup tie atmosphere as a sizeable number of Poole fans took over the clubhouse before kick-off, making themselves heard in the absence of the club’s Lardy Army who had assembled in their usual pre-match watering hole. 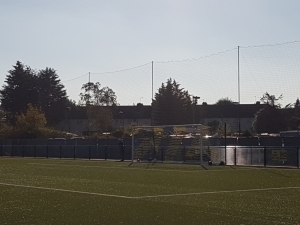 When they arrived, they would have discovered that Dom Di Paola had stayed loyal to the team that started Tuesday’s winning league match with Phoenix Sports with strikers Chris Smith and Rob O’Toole joining Charlie Harris, Sparks, and U23s goalkeeper Tom Baxter on the bench. 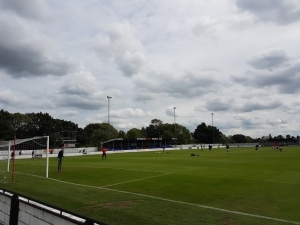 The visitors had two changes to their line-up that had thrashed Farnborough 6-0 last weekend, with Sam Griffin replacing the injured Will Spetch and the experienced Gillespie coming in for ineligible Yeovil loanee Korrey Henry, scorer of a hat-trick in that victory against the Hampshire club. 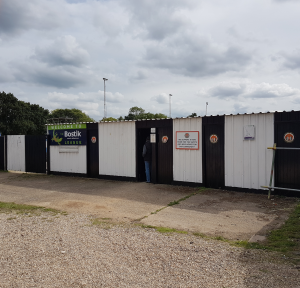 Gillespie took less than two minutes to make his mark, nipping in ahead of Josh Pelling to head a right-wing cross past the ‘keeper and inside his near post as the Hornets made a disastrous start. Yet Horsham have shown terrific battling spirit in recent weeks and almost hit back immediately when Tyrell Richardson-Brown battled away up front to set up a shooting chance for James McElligott, whose effort flew over the bar. 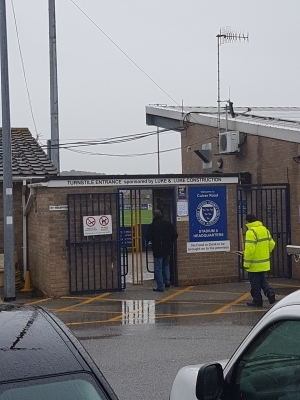 Di Paola had highlighted the threat of Luke Roberts before the match and the fleet-footed number eleven went close to doubling Poole’s lead when he collected a pass and skipped past Steve Metcalf before drilling a left-foot shot wide of the near post. Gillespie really ought to have made it two, albeit rather fortuitously, when put through on goal but with only Dean Lovegrove between himself and the goal, the former Bashley man took too many touches and fell over his own feet before managing to lay the ball off to Roberts who was quickly dispossessed and the danger cleared. 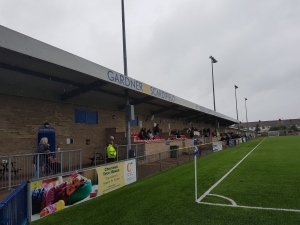 Boosted by that early lead, Poole looked the more confident side – as you might expect from a side some twenty-nine places above Horsham in the footballing pyramid – and the Hornets were thankful that Metcalf was in the right place to clear a goalbound header off the line from a corner. The hosts were finding it hard to create any clear-cut chances, with the ball holding up in the strong crosswinds, but when Richardson-Brown finally managed to get the better of the full-back, his tremendous cross caused havoc at the far post where neither Jack Brivio nor Will Hoare could scramble the ball in. Then George Hayward had a sight of goal but he elected to pull the ball back to towards the penalty spot, rather than shoot, and the ball was hacked clear. Midfielder Jez Bedford then displayed the sort of footwork that took him to Portsmouth earlier in his career when he twisted away from Metcalf, tight to the goal line, to set up Griffin for a chance that he curled over the bar from the edge of the area. Despite the visitors enjoying the better of the first half, you sensed that Horsham were far from out of this contest and so it proved when, a minute before the break, McElligott and Joey Taylor combined to force a corner from which Joe Shelley rose highest, in typical fashion, to head the ball down, over the covering defender, and into the opposite corner for the equaliser. 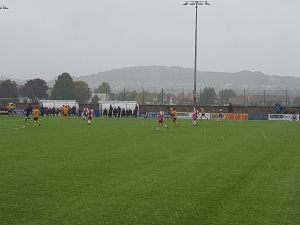 The weather abated briefly at the start of the second half but there was little of note in the opening quarter of an hour, save for the introduction of Harris and O’Toole for Hayward and McElligott and the surprising replacement of Gillespie by Steve Devlin. Full-back Jordan Alawode-Williams wasted the first opening of the half when he lashed Dylan Merchant’s underhit clearance wildly wild of the target and Corby Moore was even more profligate when Harris possession in midfield and the ball ricocheted beyond the Horsham defence. As Pelling raced out of his box, he was left exposed by the spin of the ball but Moore overhit the ball as he attempted to go round the ‘keeper and Dean Lovegrove was on hand to clean up. A good run and pass by Taylor ended with Richardson-Brown striking a decent low shot that Poole ‘keeper Luke Cairney needed to watch carefully to prevent it from slipping under his body as the sweeping rain returned and then Hoare blazed a great effort just beyond the far post, following good approach play by Lovegrove and O’Toole. The match then became punctuated by a series of free-kicks, and bookings for Marvin Brooks and Brivio, more the result of tiredness and the exacting conditions than any real malice, but the Horsham nerves were jangling when Devlin met one set-piece only to head wide of goal with a quarter of an hour remaining. Richardson-Brown was withdrawn in favour of Sparks, and Richard Gilot for Roberts, for a final ten minutes in which the Hornets twice went close to claiming a famous victory. First a terrific pass by Brivio sent Sparks racing away but, closed down by a defender, he elected to shoot early and was inches away from finding the bottom corner with a well-struck left-footer. Poole did have the ball in the Horsham net, three minutes from time, but Moore’s shot was disallowed for a foul on Shelley before Brivio and Sparks combined once more with the substitute hitting a tremendous rising shot that only just cleared the crossbar. It was a rousing end to an enthralling match with all eyes now on Monday’s draw and the knowledge of who the opponents will be for the victors in Tuesday night’s replay. It was a replay, and a game too far for The Hornets, who can be proud of their cup exploits this season and the money spinner it will have generated for the club, but while there will be disappointment that Horsham failed to reach the same stage they managed ten years ago, there can be no real complaints in terms of the effort given by the players, who gave it their all, but ultimately tired as the game progressed. Di Paola made three changes to the starting line up who began the match on Saturday, with Harvey Sparks, Rob O’Toole and Charlie Harris replacing Dean Lovegrove and James McElligott who swapped to the bench, with George Hayward unavailable. Another noticeable absentee was striker Chris Smith with injury ruling him out. 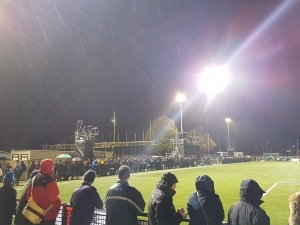 With a sizable contingent of Horsham supporters on hand to generate the atmosphere and cheer on their side, the away fans were almost silenced seven minutes in when some lovely interplay between Poole Town talisman Richard Gillespie and Luke Roberts exchange passes, but with Roberts unable to get a shot away, he returned the ball back for Gillespie to fire well wide. Hornets fans certainly had plenty to sing about though on thirteen minutes, when their side took the lead after some sloppy defending from the Southern Premier Division side let Horsham in at the back, as O’Toole collected, turned and instantly spotted Harvey Sparks unmarked on the edge of the area, and the former Bognor Regis Town midfielder took a touch to compose himself, before guiding the ball low into the bottom corner to give Horsham the lead. Horsham had a fine chance to double their lead three minutes later when a wonderfully floated freekick was sent hurling into the box, but Sparks’ failed to jump high enough to get his head above the ball, instead sending his header well over the bar despite being afforded plenty of time and space by the Dolphins defence. With Poole posing a threat going forward as they looked for a response, Horsham were made to work hard to keep the home side at bay, with a towering headed clearance by Joe Shelley and Josh Pelling beating away a fiercely driven shot, while Steve Metcalf’s superbly timed sliding challenge dispossessed the energetic Luke Roberts after the midfield dangerman threatened to bare down on goal. 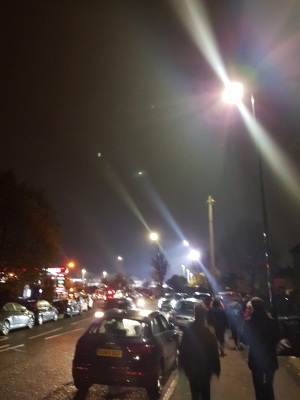 Corby Moore’s rising effort then cannoned off the roof of the stand behind the goal as Town began to press, but Horsham arguably continued to enjoy the better chances with two glorious opportunities to extend their lead passing them by in as many minutes. The first coming thanks to Tyrell Richardson-Brown’s pace seeing him emerge with the ball high up the pitch before squaring for O’Toole at the near post, but with the striker unable to finish, Poole scurried the ball away as Sparks failed to reach in time rushing in at the back post. A minute later, a fantastic slotted through ball by Richardson-Brown put O’Toole through one-on-one with goalkeeper Luke Cairney, who did well to stand up to the Hornets striker and ensure his effort deflected upwards as it crashed back off the bar with Sparks unlucky to see the bounce of the ball rise up over his head as he attempted to force home. 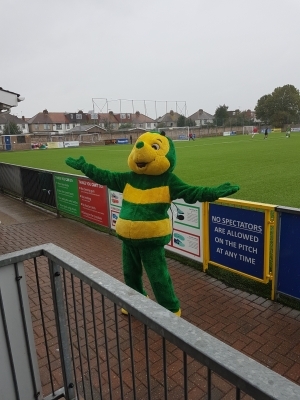 The let off proved to be the wake up call the hosts needed, and agonisingly for Horsham, it signalled the beginning of the end of The Hornets FA Cup campaign as Di Paola’s side failed to make it to the interval with the lead intact as the gave away a cheap freekick. 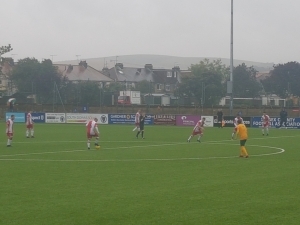 The resulting set-piece was floated in wonderfully for Dolphins captain Jamie Whisken to rise up and glance his header into the net with Pelling off his line. The hosts replaced Carl Pettefer during the interval for Steve Devlin after the defensive midfielder sustained a knock, but despite the enforced substitution, The Dolphins needed just five minutes of the second half to take the lead. Despite Horsham having suvivied an initial scare a minute before when Gillespie shot well wide following Jordan Alawode-Wiliams’ cross, Horsham failed to clear their lines with Poole’s next attack, and when the ball fell towards Corby Moore, he composed himself to fire towards goal, but despite the ball being fired at Pelling, the pace of the shot was too much for the Hornet’s shot-stopper to deal with as it richocheted backwards off his body and into the net. 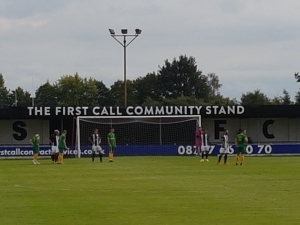 Horsham attempted to muster up a response, with an ambitious attempt by Richardson-Brown who tried to curl in from distance, but the shot was comfortably claimed by Cairney as Horsham continued to enjoy a fair share of possession, but struggling to find a way back into the contest. 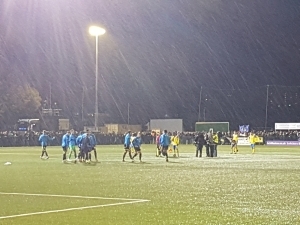 With Roberts having run himself into the ground for the hosts, Jack Dickson came on to take his place, and minutes after his introduction, Poole Town had a super chance to finish off the game when Gillespie managed to get clear and square for an unmarked Bedford who attempted to round Pelling, but the Horsham ‘keeper was having none of it, as he refused to allow himself to be embarrassed, and saved bravely at the Town midfielder’s boots. With the game waring on, both teams began to visibly tire as the game entered it’s final moments, with chances becoming more limited, however Devlin’s blast over the bar was the closest the hosts went, while Horsham had a chance late on to take the game to extra time when they won a freekick from a dangerous position some twenty-five years out. Having scored a wonderful freekick from a similar position against Carshalton Athletic to kick-start Horsham’s FA Cup run, up-stepped Charlie Harris looking to repeat his magic, and despite rifling a wonderfully taken effort around the wall and towards the back of the net, it was kept out by a remarkable save by Cairney, who did incredibly well to palm the ball away with an outstretched fingertip save. 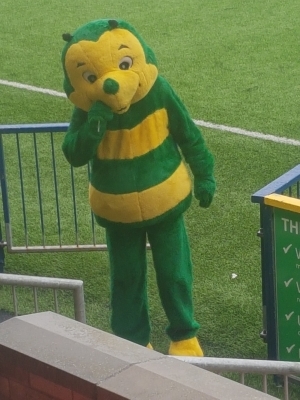 Groans from the home supporters of an additional seven minutes of injury time gave Horsham supporters some cause for optimism but it ultimately proved job done for Poole as they safeguarded their narrow lead while The Hornets headed back home proud of their team’s exploits, but ultimately having to rue the cruelty of football. Poole Town started off brightly with Luke Roberts' inclusion giving hope to the travelling fans. For the first 20 minutes or so Poole consistently got to the byline and put a number of balls into the box. The lack of a real no. 9, or any real presence in the box, meant the danger could be cleared by Haringey. It was clear that Luke Roberts was not his usual self and he was replaced by Richard Gillespie. Poole opened the score on 31 minutes when Richerd Gillespie was kicked in the head inside the peanalty area. The Haringey player received a yellow card for the but was lucky not to be sent off. Penalties are always contentious, there were no real complaints from the Haringey players and Poole's Captain for the day, Steve Devlin, stepped up to put the ball past the diving keeper. Poole Deservedly 1-0 up and the dominance continued until the break. Haringey came out like an express train in the second half but though having the bulk of the posession early on, really did not threaten the Poole goal. The makeshift back four (with Smeeton playing centre-back , partnering Will Spetch returning from a three week injury lay-off) held firm for most of the match. Charlie Davis replaced Jez Bedford on the right after 57 minutes adding a little stability on that side and it seemed that the Dolphins had weathered the storm. 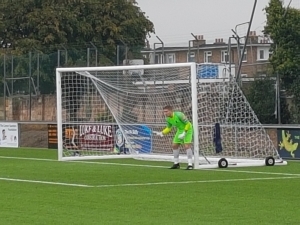 Gillespie had the chance to extend the lead when one on one with the Haringey keeper and almost squeezed the ball inside the right hand post but it was not to be. Haringey deservedly equalised with a quarter of the match to go, 1-1. After the equaliser, Poole Town came more into the game and were looking forward to at least a replay at The Black Gold on Tuesday. 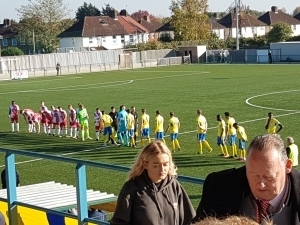 A lucky goal for Haringey (at that time against the run of play) meant they went into the draw for the First Round Proper for the first time in their history. After the second goal some of the players heads dropped and the away fans were almost silent. Sensing this Richard Gillespie encouraged the travelling support to lift the players; an action taken as criticismin some quarters. 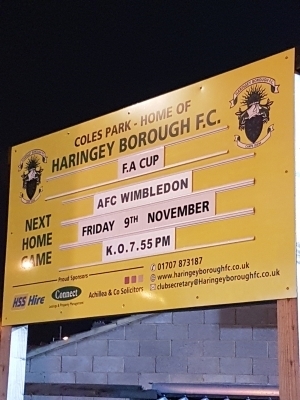 League One AFC Wimbledon avoided an FA Cup first-round upset as a last-minute deflected goal gave them victory at non-league Haringey Borough. 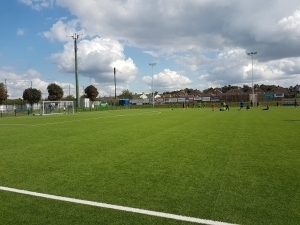 In a match shown live on BBC TV, the visitors secured the win when Mitchell Pinnock's shot hit David Olufemi and beat goalkeeper Valery Pajetat. Pajetat had produced a number of fine saves to keep his team in the match. 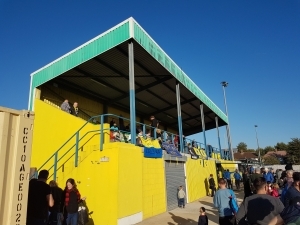 But Haringey, 18th in the Isthmian League Premier Division, were unable to score late on to force a replay. "I'm so proud of everyone... unbelievable... wow," Haringey Borough manager Tom Loizou told BBC Two. "We were under the cosh for a lot of the game but I thought they scored against the run of play. They have the privilege of training four or five times a week. "Our bunch of players are great. Our fans are fantastic. Two years ago we had 40 supporters. Nine years ago we had two fans, and one died. I'm going to give all my players a hug and a kiss - they are all fantastic." Defeat was cruel on the hosts, but a five-match run in the competition has earned them more than £150,000 and secured their future. 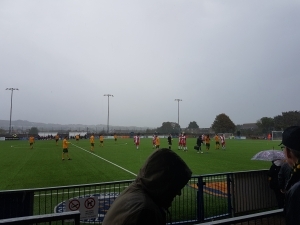 In front of an expected club record attendance of more than 2,500, the north London side thought they had won a first-half penalty when Charley Barker went to ground under a challenge from Tom Soares, but the referee waved away their protests. Haringey's Joe Staunton had the ball in the net in the second half but the goal was ruled out as he was offside. But the Dons had the better chances - Pinnock's free-kick hitting the top of the bar, Ben Purrington having a shot well saved by Pajetat, and Joe Pigott heading narrowly off target before Pinnock's late winner. 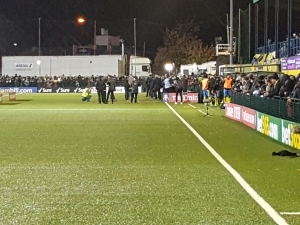 Before the game, Dons boss Neal Ardley said he expected to be sacked if his side lost against a side 89 places below them in the football pyramid. "You come into these games on a hiding to nothing," he said after the match. "People expect you to put four or five past them and it took that stroke of luck to get that win. "People said to me you should beat them, but you knew they would have 30% more in the cup and these conditions. Our boys knew we couldn't lose as they would get battered if they did."